In 1943, it was already clear that the victory of the Allies was only a question of time. The dimensions of the Holocaust were known in Palestine, but the British government adhered to the White Paper policy, and continued to bar the gates of the country to Jewish immigration. Moreover, those immigrant ships which succeeded in escaping from occupied Europe were not only prohibited from entering Palestine, but were sometimes even forced to return to Europe, although the fate that awaited their passengers was clear to all. The conduct of the British government further infuriated young Jews in Palestine. The Irgun General Headquarters came to the conclusion that the truce it had proclaimed when war broke out had to be ended, and that it was essential to take action against the British without waiting till the war was over. We said that we had to find a man to command us who had no connection with what had occurred during and after the split (i.e. the split with Avraham Stern), but it was hard to find such a man in Eretz Israel. Menahem Begin, Betar leader in Poland, arrived in Eretz Israel at this point. When war broke out, he had been arrested by the Soviet authorities and sent to a detention camp in Siberia. About a year later he was released under the terms of the Soviet-Polish treaty, which freed all Polish nationals from Soviet jails. He then joined the Polish force established in the Soviet Union (General Anders Army) and reached Eretz Israel with this army. He reported immediately to the Irgun command, but refused to desert from the ranks. Only after being officially discharged was he asked to accept command of the Irgun. Eliyahu Lankin, one of those who approached Begin, remembers that his response was: "Gentlemen, I have been a Betarite and a soldier in the Polish army, but I have no military experience." "We told him," Lankin recalls, "that we did not lack fighters. We needed a leader of authority to blaze our political and ideological path." In December 1943, Begin was chosen as Commander of the Irgun Zvai Le'umi in Eretz Israel. He established a new General Headquarters, which included Aryeh Ben Eliezer, Eliyahu Lankin and Shlomo Levi-Lev Ami (Levi was the only one who had been a member of the previous command). At its first meeting, the General Headquarters passed two important resolutions: the first - that an armed struggle against the British Mandatory government had to be launched without delay, and the second - that the Irgun had to detach itself from the Revisionist party and determine its own path. TO THE HEBREW NATION IN ZION! We are in the last stage of the world war. Each and every nation is now conducting its national reckoning. What are its triumphs and what were its losses? What road must it take in order to achieve its goal and fulfil its mission? Who are its friends and who its enemies? Who is the true ally and who the traitor? And who is proceeding towards the decisive battle? Sons of Israel, Hebrew youth! We stand at the final stage of the war, we face an historic decision on our future destiny. The truce proclaimed when war broke out has been violated by the British authorities. The rulers of the country have taken into account neither loyalty nor concessions nor sacrifice; they have continued to implement their aim: the liquidation of sovereign Zionism. We must draw the necessary conclusions without wavering. There can no longer be a truce between the Hebrew nation and youth and the British administration of Eretz Israel, which is betraying our brethren to Hitler. Our nation will fight this regime, fight to the end. Rule over Eretz Israel must immediately be handed over to a provisional Hebrew government. a. establish a national Hebrew army. b. conduct negotiations with all authorized bodies on the organization of the mass evacuation of European Jewry to Eretz Israel. The establishment of a Hebrew government and the implementation of its plans - this is the sole way of rescuing our people, salvaging our existence and our honor. We will follow this path, for there is no other. We will fight! Every Jew in our homeland will fight! Our fighting youth will not be deterred by victims, blood and suffering. They will not surrender, will not rest until they restore our past glory, until they ensure our people of a homeland, freedom, honor, bread, justice and law. And if you help them, then your own eyes will soon behold the return to Zion and the rebirth of Israel. May God be with us and aid us! When the struggle began, the Irgun stipulated two restricting conditions: avoidance of individual terror as a method and postponement of attacks on military targets until the war ended. The first target of the Irgun fighters were the immigration offices of the British Mandatory authorities. These offices, more than anything else, symbolized the restriction of immigration and the frustration of efforts to rescue the Jews of Europe. The Immigration Office was careful to grant certificates only according to the quota fixed by the White Paper, i.e. the number of immigrants was not permitted to exceed 1,500 per month. From this tiny number were deducted those Jews who immigrated illegally and were caught by the authorities. According to the White Paper, immigration was to cease completely on March 31, 1944. On Saturday night, February 12, 1944, Irgun fighters attacked immigration offices simultaneously in Jerusalem, Tel Aviv and Haifa. The operation went smoothly and without casualties. Two weeks later, the fighters set out again, this time to blow up the income tax offices, again in the three large towns. An income tax law had been introduced in Eretz Israel in 1941 and, as anticipated, had proven highly unpopular, particularly since most of the burden fell on the Jewish population. One of the reasons for selecting this target was that even those who did not support the Irgun campaign against the British were unlikely to condemn an attempt to prevent the collection of income tax. This operation also proved successful and claimed no casualties. British Intelligence office after bombing. After the baptism of fire, it was decided to take a more daring step and attack the nerve center of British rule, British Intelligence and the police. Once again the operation was coordinated to take place simultaneously in the three large towns. In Jerusalem, the task was more difficult since the British Intelligence was housed in the Russian Compound, as were the police headquarters and the law courts. Despite the difficulties, the Irgun fighters, under Rahamim Cohen (Gad) succeeded in infiltrating the British Intelligence offices and placing the explosives. However, the duty officer that night, Sergeant Scott, on a routine patrol of inspection noticed a suspicious movement on the balcony. He was injured when fire was opened on him, but before he collapsed he succeeded in shooting one of the Irgun fighters, Asher Benziman (Avshalom). Despite the exchange of fire, the sappers succeeded in preparing the explosive devices and retreating. Several minutes later, there was a loud explosion and the building collapsed. Benziman succeeded in escaping, but died of his wounds shortly afterwards - the first casualty of the revolt. The British officer also died as a result of his injuries. The raid on the British Intelligence headquarters in Jaffa was commanded by Amichai Paglin (Gidi) and the attack on the Haifa British Intelligence was led by Yaakov Hillel. The two raids were carried out successfully. As more operations were undertaken, the fighters gained military experience and they became increasingly daring. On May 17, 1944, some 40 fighters set out to attack and occupy the government broadcasting station at Ramallah in order to make an underground broadcast from there. The takeover was smooth and was carried out without loss of life, but the broadcast itself did not take place because of an unexpected hitch in operating the transmitters. 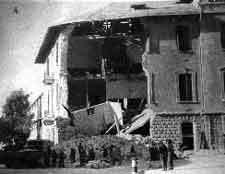 On the other hand, two months later, the blowing up of the district British Intelligence in Jerusalem was carried out without a hitch: on the night of July 13, 1944, an Irgun unit broke into the building in Mamilla Street, detonated explosive devices and retreated without suffering casualties. 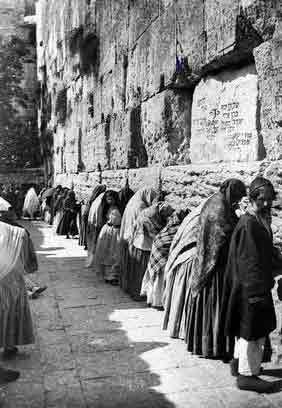 One of the operations which undermined the prestige of the British authorities and made them the object of ridicule was the 'Wall' scheme, which concerned prayer arrangements at the Western Wall. In the late nineteen twenties, the Arabs had already begun to complain that blowing the shofar at the Western Wall was an insult to Islam. In 1931, the King's Order in Council (the legislative authority of the Mandatory government) stipulated that the Moslems' ownership rights to the Temple Mount also encompassed the Western Wall area. As a result, Jews were banned from blowing the shofar at the Wall, despite the fact that this ceremony is an integral part of the Rosh Hashana (New Year) and Yom Kippur (Day of Atonement) prayer services. The ban deeply offended Jews, and the Irgun decided to act. After the imposition of the ban, Irgun and Betar members "smuggled" a shofar into the Western Wall area every Yom Kippur. There a volunteer was waiting to blow the 'Tekia Gedola', the blast which marks the end of the fast. This was not easily done, since large numbers of British policemen were stationed along the routes to the Wall and conducted careful searches of the belongings of the Jews visiting the Wall. The shofar blower was usually arrested and jailed in the Kishleh, the police building in the Old City, which had served as a jail since the Turkish era. (The building is still standing and is now used by the Israeli police). The blowing of the shofar at the Wall at the end of Yom Kippurr was not only a religiously ceremony, but also bolstered national pride throughout the country. On Yom Kippur 5703 (September 1942), Menahem Begin visited the Wall and witnessed the British policemen bursting into the area in search of the Betarite who had blown the shofar. Any British Constable who will commit acts of violence near the Western Wall on the Day of Atonement and, in defiance of the moral law of civilized people, will disturb the worshippers assembled there and will desecrate the sanctity of prayer will be regarded and LISTED by the HEBREW Youth as a CRIMINAL OFFENDER. Visitors or passers-by, whether Moslems or Christians, will not be disturbed in their approaching or passing the Western Wall. The tension mounted. The Irgun created the impression that it intended to concentrate large forces in the Western Wall area, to bar access by violent means. This was, however, a diversionary tactic, and the Irgun had an entirely different plan in mind. As Yom Kippur came to an end, attacks were launched at four police stations throughout the country. These buildings, known as Taggart fortresses, were large structures of reinforced concrete, built in the 1930s according to the design of the British engineer, Sir Charles Taggart. The Irgun's warnings about the Western Wall were examples of psychological warfare, serving to divert attention from the main military operation. Surprisingly enough, the authorities heeded the Irgun's warnings, and not a single British policeman was present in the Wall area on Yom Kippur. The traditional blowing of the shofar after the final prayer took place without interruption, and the congregation then burst into a loud rendering of "Hatikva", the national anthem. No clashes occurred that day at the Wall or en route to it, and the British detectives, who were present in mufti, were disappointed by the absence of Irgun armed forces. They were unaware that the Irgun's fighting units were at that very moment conducting an operation against the Taggart fortresses in Haifa (under Rahamim Cohen), Kalkiliya (under Nathan-Niko Germant), Gadera - Katra (under Yehoshua Weinstein and Shraga Alis) and Beit Dagan (under Yaakov Sika-Aharoni).